The Florida Keys is a 113-mile long chain of coral islands connected by 42 bridges at the southern tip of Florida, making Key West at the end of the chain the southernmost point of the continental United States. These islands are famous for excellent beaches, water sports, scuba diving, seafood, key lime pies, coconuts, miniature deer and wild Halloween parties. The Florida Keys is a fantastic vacation destination for families, young and old, because they offer a wide variety of activities to keep kids and adults entertained and educated. There is also a wide enough offering of foods that even kids with strict gluten free diets can find plenty to eat. 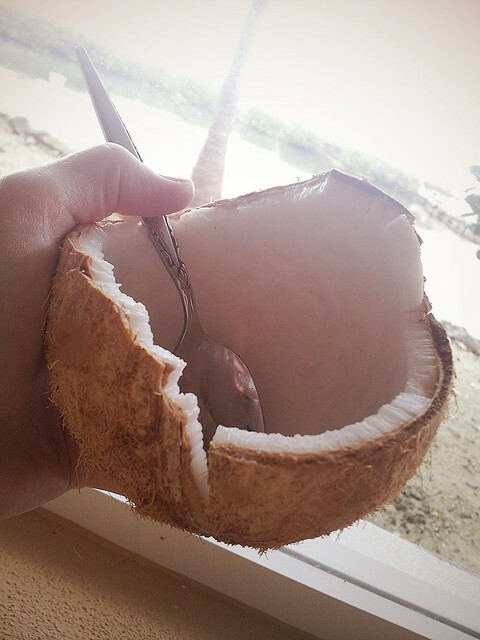 Fresh seafood (grilled, blackened or steamed) and fresh tropical produce (like the coconut pictured, gigantic avocados, mangoes, star fruit, kumquats, and key limes) are all in abundance, and all naturally gluten free. So at most restaurants throughout the Keys, you’ll have no trouble finding a filet of grilled fish and a salad to enjoy. But if you are looking for a little bit more in the way of gluten free foods and family-friendly ambiance. The northernmost island, Key Largo (made famous by the 1948 Bogart flick and home of the annual Humphrey Bogart Film Festival) proves the most challenging of the islands to find family-friendly gluten free grub, but there is some. Ballyhoo’s and Key Largo Conch House both offer cool ambiance, GREAT fresh seafood and are accommodating of gluten free diets. The Mindful Mermaid, tucked into a shopping plaza does offer specifically gluten free items with a funky tie-died vibe. Num-Thai is an extremely popular Thai and Sushi restaurant (it’s ALWAYS PACKED) in Key Largo that shares a strip mall with a fresh juice bar which is good to hit on your way out of town. When at Num-Thai, try to snag one of the sunken tables. The kids will love taking off their shoes and sitting in the boat chairs. Heading south about twenty miles, you arrive in the more stylish islands of Islamorada, the sports fishing capital of the world. The Presidential Bush family has long visited Islamorada for the sports fishing and pristine back waters. Gluten-friendly restaurants include Midway Cafe & Coffee Bar which has a most excellent GF blueberry muffin and bright tropical decor (pictured), the Overseas Kitchen, a small Mediterranean spot with seriously delicious GF felafels and great quinoa salads, and Bitton Bistro Cafe that has a very kid-friendly interior with gluten free crepes and crustless quiches. If you happen to visit the Overseas Kitchen on a Monday or Friday, be sure to stop by the bustling farmer’s market in the field next door because there are several vendors selling gluten-free fresh and baked goodies. Also, when driving through the islands of Islamorada, look for the ginormous lobster on the side of the road. Continuing south to the “Heart of the Florida Keys,” you arrive in Marathon which is exactly halfway between Key Largo and Key West. Marathon is home to the famous Turtle Hospital (yes, DO book a tour), Sombrero Beach (see pic above), the Seven-Mile Bridge (that was blown up in the Schwarzenegger movie, True Lies) and the educational Pigeon Key, among other points of interest. One of the coolest restaurants in Marathon is the Island Fish Co. Arrive by car, bike, boat or helicopter (yes, they have free boat docks and a helipad) for a killer sunset view. Kids are served meals in take-home Frisbees and the chocolate cake on the menu is gluten free. For the largest selection of gluten free car snacks and a full-service gluten free/vegan juice bar, head to Food for Thought. If you need a gluten free pizza, pick one up at Driftwood Pizza & Subs. 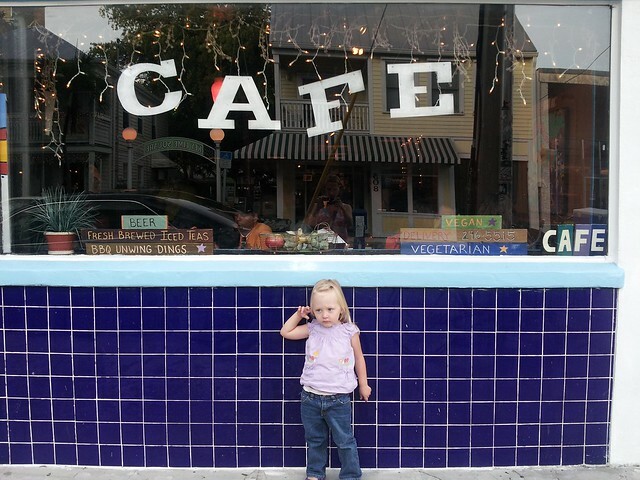 And when you want a sweet treat, head to the very fun Sweet Savannah’s. Continuing south over the Seven Mile Bridge and down another 20 miles, you will arrive in Big Pine Key, the funkiest of all the islands in the Florida Keys. Big Piners are proud of being nearly “off the grid.” One visit to the Good Food Conspiracy and you’ll know what I mean. It’s funky, but in a good way. The GFC is a great spot for refueling with some yummy gluten free foods and grabbing snacks for the road. If you happen to be driving through Big Pine Key around sundown, slowly drive through the residential side streets to sneak a peek at the local key deer, a special breed of miniature deer that inhabit the island. Don’t feed them or hit them with your car (both are criminal offenses), but do snap a pic to wow your friends. 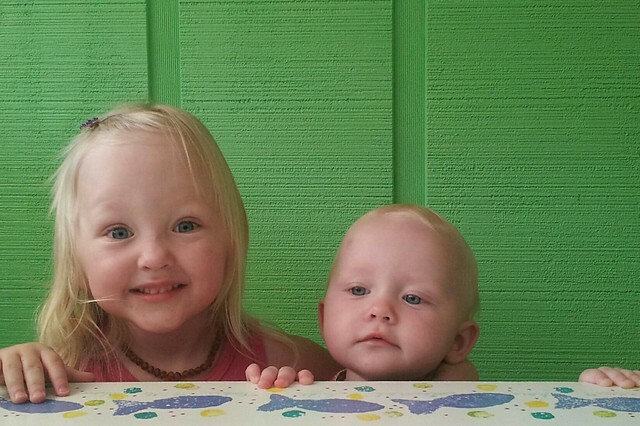 A few miles further south on Ramrod Key, you’ll find a super fun putt-putt golf course and restaurant oasis called Boondocks Grille that is fun to visit day or night. There aren’t a ton of gluten free items on the menu, but there’s enough to get by. For a higher end experience and a wider gluten-friendly menu that includes items like fondue and poutine, head to the very hip Square Grouper on Summerland Key. And finally, at the end of the island chain, you arrive in the most famous and wildest of all the islands, Key West, home of the annual Fantasy Fest (I DO NOT recommend taking young impressionable children to Key West around Halloween…trust me on this one. Two words: body paint), famous Duval Street of food, drinks, live music and shopping, pirates, ghosts, key lime pies and six-toed cats. 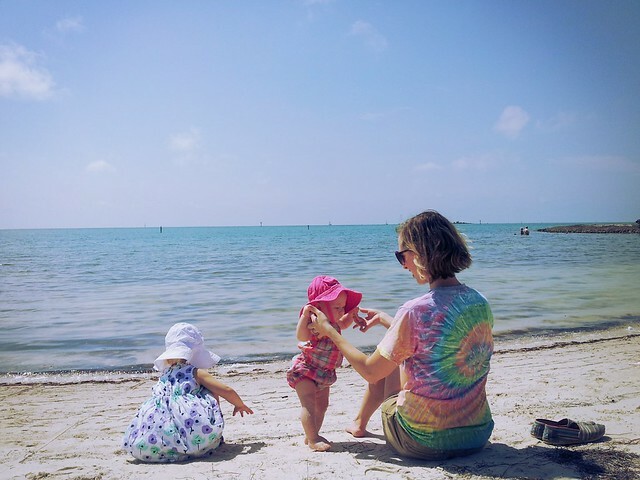 Fun things to do in Key West with kids are taking a Ghost Tour, visiting the Pirate Museum, riding the Conch Train and watching the street performers at Mallory Docks. One of the most quintessential Florida Keys food items is an authentic key lime pie. It’s unacceptable to visit and not eat a slice, which used to prove a challenge for celiacs. But I am happy to report that the Key Lime Pie Co. offers a fantastic GF crust on its pies and chocolate dipped pie bars. Yes. They dip a slice of key lime pie in dark chocolate and serve it on a stick. I know, right! In the event you want anything else to eat besides chocolate-dipped pie on your vacation (I won’t judge if that was your plan), there are several extremely cool gluten-friendly restaurants in Key West. Like Thai Life, a floating Thai restaurant in the harbor, Blue Heaven where chickens wander between your legs on the patio, The Cafe where fresh juices and body piercings are in equal abundance, and Le Petit Paris which serves gluten free pancakes and crepes on a Duval Street patio. If you need to shop for gluten free snacks or fresh produce while in Key West, Help Yourself is the spot. How do I know about all of these places? I was born and raised in the Florida Keys and have been gluten-free for 14 years. 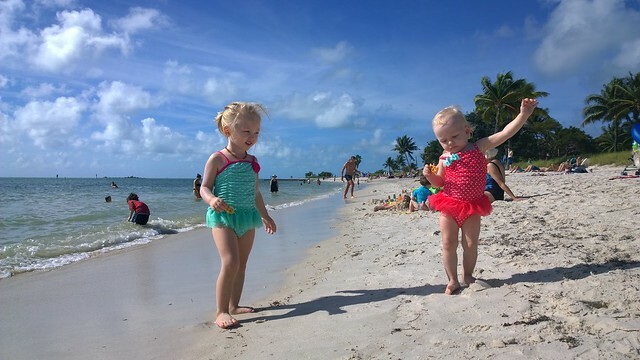 I have lived off an on in the Florida Keys throughout my adulthood and love spending the winter months by the beach so my girls learn to love the water as much as I do. I have eaten at all of these places and can confirm that a gluten free family will have no problem finding good grub while visiting. Happy travels and don’t forget to pack your sunscreen! These are great tips! It’s hard enough to stick to one’s diet on vacation without needing to eat gluten-free. I want to head to Florida now…. It’s great to have options, thanks for sharing the suggestions! I would love to visit the Florida Keys one day, and your post makes me want to go sooner! Thank you, Allison, for this comprehensive description of the Florida Keys and the Gluten-free places to eat. This is a wonderful post for anyone who is planning on visiting there and wants gluten-free food. Thank you. This is a nice list and one many gluten free children and adults can make god use of. I like the diversity of the list it makes things easy! Wow, this is such a great post! Thank you for all the wonderful ideas and for compiling all these great places. Nice post. My daughter and her boyfriend drove from Miami to Key West for a couple of days during her Christmas vacation. She fell in love with the key lime pies. She said it was a beautiful place to visit. What a helpful list for anyone travelling who has gluten issues. Oh how I’d love to be there right now! I love the Florida Keys when we were there, breathtakingly beautiful. I’m not on gluten free but I can confirm that the fish there is fantastic quality. A shame we didn’t have more time, just a quick trip down and back but I enjoyed every minute of it despite a lot of the time being in the car. I would love to visit the Florida Keys with my family. There are so many wonderful places to see. Want to visit the Florida Keys. Lets see if I can visit in this year or next. Thank you so much for this list of GF options in the Keys! Your page made my trip SO much more enjoyable and took away the usual daily stress of trying to find a place I can eat dinner when we are on vacation. We ate at the Key Largo Conch House (and had the very best meal eating out since my move to Florida!! ), Blue Heaven, and the Key Lime Pie Co. Such great food and even better memories! Thanks again!! Thank you for this list. My family of 6 eat gf and we are heading to Key West in a couple of weeks. This is soooo helpful!! I haven’t been to the Keys in so long, these tips are really helpful. I love the water at the Keys, so crystal clear and pretty blue.